We’re often asked for opinions on Apple (AAPL) and our approach/outlook is unchanged … at least not much. We do note that AAPL flipped to a bullish point-and-figure condition with a slight boost in price objective. But we still see the stock as vulnerable to a continued price drop or extended trading range. I still love the answer that Jeff Gundlach gave during the Q&A following a recent webcast. His response to “Should I buy Apple?”: “That depends. Are you really, really, really a long-term investor? How will you react if the price drops from $425 to the low $300s? If your time horizon is relatively long and you’re comfortable with a price that plummets from time to time, I’d say it’d be OK to buy/accumulate AAPL.” We still think that trailing stop protection on stocks like AAPL is a really good idea. Expectations at Hugh’s Staples (SPLS) did relax a little bit — but the long-term outlook (for patient investors) is still strong. Recent Round Table selection Intel (INTC) is among the best-positioned companies in the Issue 7 update. 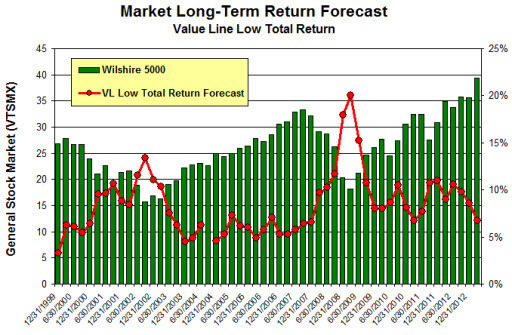 The median Value Line low total return forecast is 6.7% compared to 6.8% last week. ← Sonic Restaurants (SONC): Did We Notice?